We had an interesting and very informative presentation on Acadian Weaving at my fiber arts guild, the Riverbend Fiber Arts Guild, this past weekend. The guild hosted Debbie Todhunter, a hand weaver who has done research on Acadian weaving, interviews with several Acadian weavers, and compiled a wonderful video presentation that she shared with the guild. and brown cotton bolls before ginning. The Acadians are of French Canadian descent and immigrated from the Canadian maritime provinces to southern Louisiana in the mid-1700s after being exiled by the British. 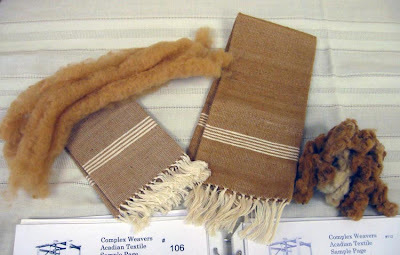 The Arcadain weaving style is unique—a plain weave done on two-harness looms using primarily short-staple brown cotton. The surprising diversity in patterns (mostly with stripes) was quite astounding considering they were achieved with a limited color palette on two harness looms. This weaving style illustrates a blending of cultures, resources and artistic ingenuity of these people. Ms. Todhunter distributed samples of the brown cotton to meeting attendees who had the opportunity to try carding the fibers. Also on display were woven samples from an extensive, 150 sample study on Acadian Weaving done by the Complex Weavers Study Group. If you ever have the opportunity to visit Louisiana's Cajun country, look up the history of these textiles. 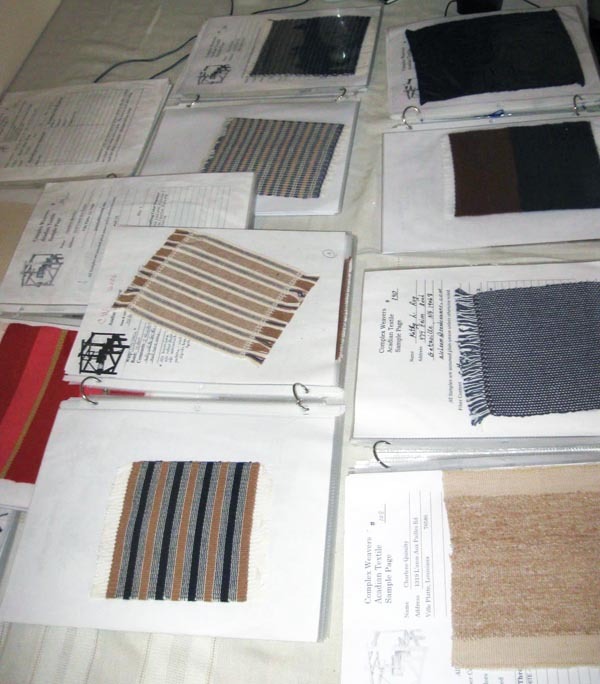 For a recap of Ms. Todhunter's presentation at the Riverbend Fiber Arts Guild, click here.